WH-751 versatile single spindle semi-automatic benchtop coil winding machine with tailstock for transformers, chokes, motors. Microprocessor controlled, capable of holding 999 program sequences, which may be run independently or in selected blocks for compound windings. Spindle drive - High torque brushless DC induction motor. Selectable spindle drive ratio, long bed, tailstock, large range of accessories. Transformers, chokes, solenoids, motors, inductors with heavy, medium and fine wire. Tensioner stand, tailstock, footswitch and comprehensive manual. Wire tensioner, wire guide head, custom tooling etc as required for application. 800 / 3000 rpm (belt changeover) or 400 / 1600 rpm (option). 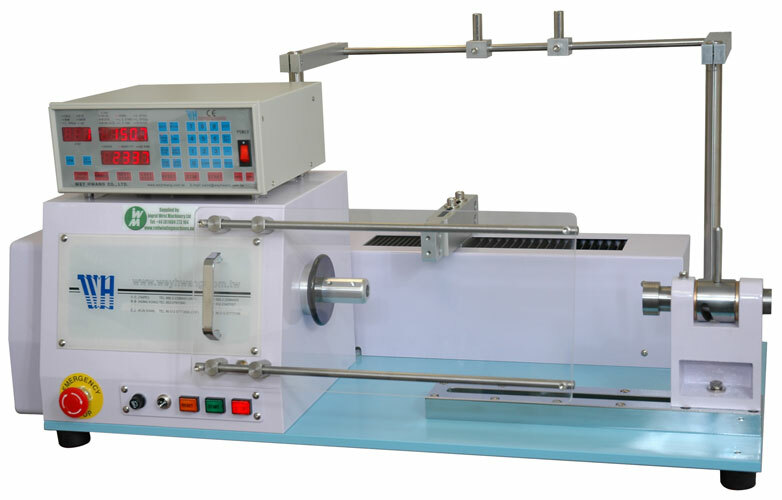 The WH-751 is a benchtop coil winding machine with digital control for semi-automatic operation, and tailstock for additional support for the workpiece. Two spindle drive ratios can be selected by means of a belt and pulley system to provide a wide range of torque and speed combinations for maximum versatility. Alternatively, users requiring higher speed may prefer the 3000 rpm maximum single range option. The digital control regulates all of the fundamental winding parameters such as winding speed, wire pitch, acceleration, braking, and turns count. Using the simple programming system and multi-step programs, complex windings can be generated with ease. Stored programs can be instantly recalled, reducing machine setup time for product changeover. Depending on application, the user may choose from a comprehensive selection of accessories, including wire guide heads, wire tensioners, taping attachments, and a variable speed footpedal. 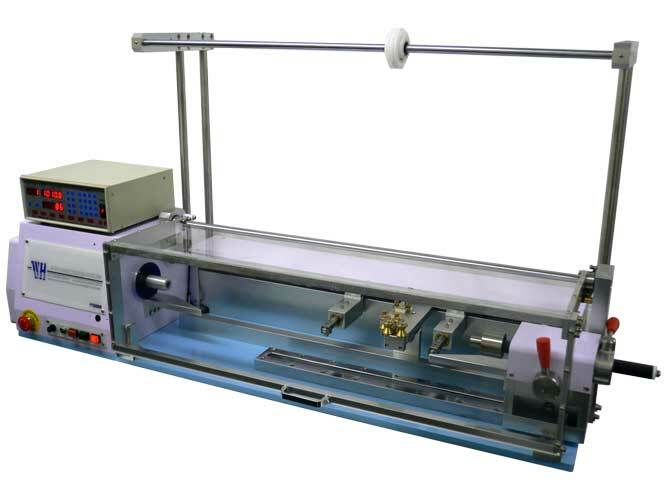 Using appropriate accessories, this versatile coil winding machine is capable of winding a wide variety of products and is therefore an excellent choice for general use in production or prototyping departments.